PowerShell Desired State Configuration (DSC) is a great way to automate the deployment of any type of environments. The DSC engine has matured a lot over the past 2 years, and is now ready for prime time within the enterprises. However, I feel like this is still a component of PowerShell that is too little known in the industry. Be it because people have not yet heard of it (it was only introduced in WMF4 after all), or because people get scare by its apparent complexity, PowerShell DSC does not yet have the exposure it should. This article aims at answering the most frequent questions I get about PowerShell DSC when I try to introduce its concepts to some of my clients. The answer to the questions are mine, and I am trying to vulgarize the concepts as much as possible. PowerShell Desired State Configuration (DSC) is an engine within PowerShell version 4 and greater that allows a user to specify an end result configuration (a Desired State) for a machine to be in, and have it automatically configure itself to match that end result configuration. The Windows Management Framework (WMF) 4 and greater include a service component called the Local Configuration Manager (LCM) that is responsible to orchestrate the configuration of the machine into its Desired State. Via PowerShell, users will create what I refer to as a DSC Configuration Script (which you shouldthink of as a definition/description of what the Desired State should be), and pass it onto the LCM for it to start automating thr configuration. Why not use a simple PowerShell script to automate the configuration? Fair question indeed. In the past, we could simply create a .ps1 PowerShell script and execute it manually on a bunch of machines to automate their configuration in a end result state. However, what if that end result state was to change and be modified by somebody on the machine? How can we ensure the machine is always kept in the end result state then? PowerShell DSC tries to solve this by introducing the concept of Configuration Modes. The LCM can automatically detect whenever a machine has steered away from its Desired State and take action. ApplyOnly: which tells the LCM to simply apply the desired configuration once, and then to do nothing even if the machine steers away from its Desired State. ApplyAndMonitor: which tells the LCM to apply the desired configuration once, and then if the machinesteers away from the desired state, to simply reports discrepancies in the logs. We could then use a tool like System Center to send notifications to the IT team when a server node is no longer in the desired state, allowing them to go an contact the users who changed the Desired State to learn more about why a specific change was made. ApplyAndAutocorrect: which tells the LCM to apply the esired configuration, and whenever it detects that the machine is no longer in a Desired State to automatically fix it so that it becomes compliant with the desired state. Using this mode, the LCM will still report all discrepancies in the logs. To what frequency is the LCM checking for changes to the Desired State? By default the LCM will check every 15 minutes to see if the machine steered away from its Desired Configuration, but this can be changed as part of your DSC Configuration Script (definition of the Desired State). What is a Pull Server? A pull server is a central repository for all of your DSC Configuration Scripts. When configured in DSC Pull mode, the LCM will ping the Pull Server on a regular basis to check if it Desired State has changed or not. How can I install a PowerShell DSC Module? Go to the PowerShell Gallery PowerShellGallery.com which is supported by Microsoft. The easiest way from there is to ensure your have the PowerShell Get features availble (included in WMF 5). There are instructions on the site on how to proceed from there. What is a DSC Module? Think of a PowerShell DSC resource as a software component that can be configured via PowerShell DSC. For example, if you are to build a new Domain Controller using DSC, once of the component you will need to configure is Active Directory. Well, there is a unique DSC Module for AD that allows you to configure things like Users, OU, etc. There are even DSC Modules for Firefox and Chrome, assuming you need to install and configure specific browsers on your machine using DSC. DSC Modules are made up of resources, that each take care of a specific component within the software piece being configured by the module. Alright, this is normally the point where I’ve lost all of you, so let me try to summarize this further. If we take the Active Directory (AD) example, there is an AD DSC Module. The component of the AD DSC Module that allows us to create new users is a module called ADUser. This resource contains all the logic required to interact with a User object (CRUD). How are Resources working internally? Every resource needs to have at least 3 methods: Get-TargetResource, Set-TargetResource, and Test-TargetResource. There is nothing preventing a resource from having more than these 3 methods, but these need to exist for a resource to be valid. Get-TargetResource: This method retrieves the current state of the machine. Let me vulgarize the process here a bit. The method performs a scan of the current environment and stores values in a variable (let’s assume it stores it in an XML format). So in our Active Directory example, it will scan all users in AD and will return the current list of users as XML. This method does nothing more than scanning the current environment and returning it CURRENT state. 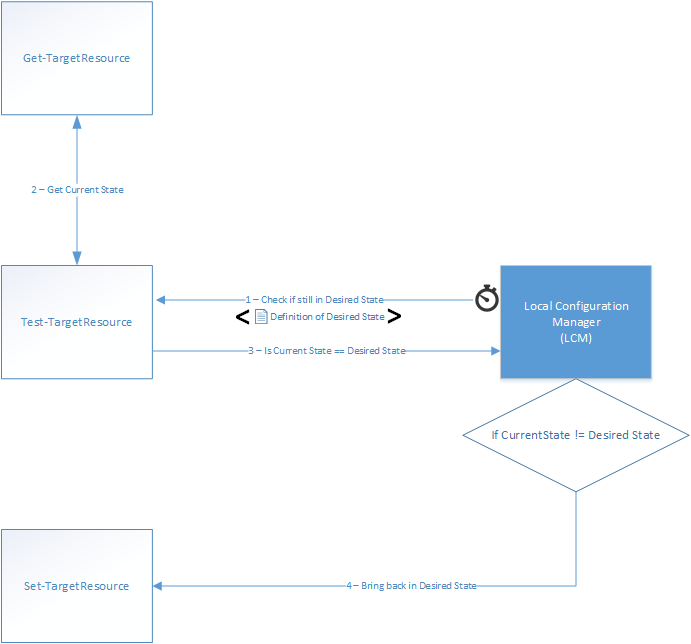 Test-TargetResource: This method is being called by the LCM everytime it checks to see if the machine steered away from its Desired State. The LCM already knows how the machine should be configured (its Desired State), but it needs to compare it against the Current State to see if they match. To get the Current State, the Test-TargetResource method simply makes a call to the Get-TargetResource method. If the Current State and the Desired State match, then the machine is all configured properly, but if they don’t then that means the machine steered away from its Desired Configuration. The Test-TargetResource method simply returns True or False to the LCM. If the method returns a False, meaning the machine is no longer in its Desired State, then the LCM will need to take one of the 3 actions mentionned above (ApplyOnly, ApplyAndMonitor, or ApplyAndAutocorrect). In the case where the LCM is configured to ApplyAndAutocorrect, LCM will call into the Set-TargetResource method to bring the machine back in its Desired State. Set-TargetResource: This method is responsible for bringing the machine to its Desired State Configuration based on the DSC Configuration Script (definition of what the Desired State is). When called, this method doesn’t care at all about the Current State. All it wants to do is to bring the environment back to its Desired State. In our Active Directory example, assume the Desired State mentions that a user named “John Smith” has to exist and be part of the Domain Admins group, if someone by mistakes deletes that user, when called this method will automatically recreate the user so that the environment is back to its Desired State. I saw in “http://www.spsevents.org/city/Montreal/Montreal2016/Lists/SPSSessions/Attachments/63/SharePoint%20Saturday%20Montreal%20-%202016-%20Automatisation%20PowerShell.pptx” that you spoke about SharepointX. As I have to clone a production server, i’d like to be able to use sharepointx in order to create a test machine.